Do you want to know what my reply was? Obviously, that wasn’t my whole reply, but it was the overall thought of the email I sent back in response. I wrote a post on how to beat a 2-3 zone defense not too long ago, but admittedly, a lot of the strategies require that the defense is stepping out and respecting the outside shot (I’ll talk about this a lot throughout the article). If the defense plays close to the ring at all times and doesn’t challenge the shot (like most youth teams do), these strategies become incredibly hard to implement. So I decided to create this post that shares with you why zone defense is effective in youth basketball, why coaches use it, how it’s hurting the game, and also to answer any arguments that coaches in favor of zone defense have. I’ll mostly be referring to the 2-3 zone defense for this article since that is by far the most popular zone to play at a youth basketball level. Zone defense is incredibly effective at a youth basketball level. That is a 100% indisputable fact. Coaches use zone defense because it flat out works against young teams and players. 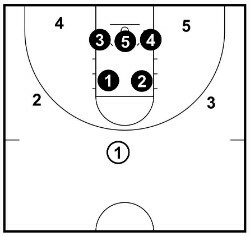 How a 2-3 zone will usually set up in youth basketball. We all know that most of the points scored in youth basketball come from layups and shots taken from close to the ring. By implementing a zone defense, the defensive team packs the paint and takes away the driving lanes to the hoop. What’s option does this leave the offensive team with? The outside shot. Therefore, since the offensive team can’t get to the basket and take a good shot, you’ll see a bunch of young players chucking up long-distance shots and praying they’ll go in. As I’m sure you can imagine, not many of these shot attempts are successful. Most of these youth athletes are simply not physically developed enough to make outside shots consistently. They lack the strength required to shoot the basketball properly. But since that’s the only open shot they can get, they take them anyway. Young players don’t have the strength to make this skip pass. To put it simply, a ‘skip pass’ is a pass made from one side of the court to the other ‘skipping’ other offensive players. When the offensive players aren’t physically strong enough to make this pass, it allows the defense to flood one side of the court without needing to worry about shooters on the other side. Doing this makes it even more difficult for the offensive team to find gaps in the defense to penetrate. In my opinion, there are three main reasons why coaches implement a zone defense in youth basketball. And, surprisingly for an article completely against zone defenses, they’re not all terrible reasons. This is the number one reason why coaches use zone defense in my opinion. Because they want to win. The reason for why coaches want to win can vary greatly. Some reasons nobler than others. 1. To fuel their ego. 2. To keep their team competitive. 3. To gain recognition from others. 4. To keep players from leaving their team. 5. To keep the players and parents happy. As you can see from that list, not all reasons are negative reasons. I’ll openly admit that I had this exact feeling when I first started coaching. When your team runs a zone, you look like a much smarter coach simply because it takes advantage of the offensive team’s major weaknesses. Players look organized on the court, the zone is effective, the opposition struggles to score, etc. It’s incredibly easy to get caught up in appearing like you’re a good coach when all you’re really doing is putting every player in the limited area that the opposition can shoot from and instructing them to stand there. If you run a man-to-man defense, the defense doesn’t look as organized, it’s much harder to play help defense, and the opposition will score easy baskets while your team gains more experience. All coaches want to look like they’re having an impact on the game, but it’s important that we all keep in mind what’s best for your team’s long-term development. Whether they want to or not, some coaches do feel forced to use a zone defense just to stay competitive with the other teams in their league. This reason I can understand and it’s a decent argument in favor of playing zone defense. I think we call all agree that no youth basketball team should ever lose by any number close to 50 points. Using a zone defense can turn a would-be blowout game that’s embarrassing for the players, into a closer and more respectable game. Your team is playing against the wrong competition. You shouldn’t have to use a zone to be competitive. If your team does, you need to find a new league, improve the players on the team, or figure something else out to solve the issue. Playing a zone defense isn’t the best long-term answer to your troubles. All coaches must remember that our focus should be on the futures of the athletes we coach. I assure you that in a few years no one will care that you won the under 10’s championship by implementing a zone defense and forcing the opponents to shoot from outside. No one. The first three reasons I talk about are the same that Tyler describes in his article here. I’ve added a fourth reason, but completely agree with the first three and wanted to share my thoughts on them also. 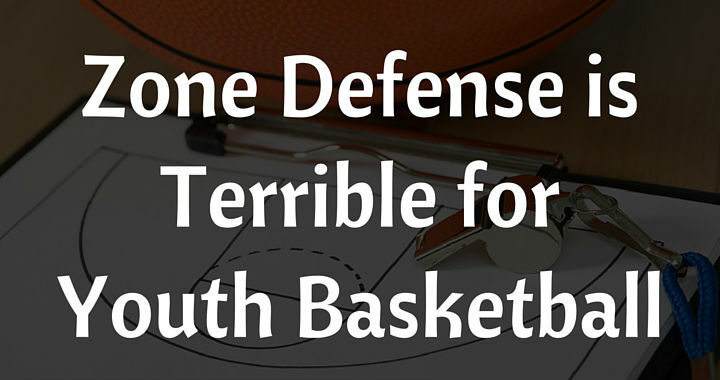 Here are the 4 main reasons why zone defense is terrible for youth basketball. I’m not saying that there’s nothing a player who runs a zone will learn from a zone that will assist their man-to-man defense. They still need to close out, still need to communicate, still need to play help defense, etc. Please know that I understand that. But there are many poor defensive habits that will also come with running a zone that players will also develop. And let me be clear… these really are habits. Ask any coach that receives the unenviable task of trying to convert a life-long zone player into a man-to-man defender. Some of these habits are really, really hard to break. 15. Fewer opportunities for bigger players to guard the ball. Quick note: If winning is your number one priority, this point will be incredibly hard for you to comprehend. By running a zone defense in youth basketball, you’re also doing a large disservice to the offensive team, too. But is that something you should have to worry about? After all, your task is to stop the other team from scoring, not help them. Right? Coaches have to understand that we’re all in this together for the development of the players. Do you really want an 8-year-old team chucking long-distance shots at the ring because they can’t get any closer so that you can win an 8-year-old basketball game? Because, unfortunately, that’s the only thing a zone defense allows them to do. Please don’t think I’m saying that you should sit back and allow the other team to score… because I’m not at all. But I do think that we need to give the offensive team a chance to make smart basketball plays and experience different offensive opportunities that a zone defense doesn’t allow. They won’t get to practice moving the basketball while being pressured, their cuts are useless because the paint is flooded with 5 defenders, setting screens to get open is pointless because the defense is leaving them open and waiting for them to shoot anyway, and there’s plenty of other lost opportunities for offensive development. Again, similar to the point on defensive habits, I understand that the players will still learn and grow against a zone… but they won’t learn half as much that will prepare them for the future as they would if they were playing against a man-to-man defense. 3. Zone defense doesn’t prepare players for the next level. One of the most important tasks of a youth basketball coach is to prepare their players for the next level of basketball. A player that is taught man-to-man defense when they’re young will have a much easier transition to playing zone defense than a player who plays zone defense exclusively at a young age will have transitioning to a man-to-man defense when they’re older. Another thing you’ll notice is that as the competition gets better and the players more skilled, the less zone defense you will see implemented. This is because zone defense works great against young teams with no skill but struggles against players with a lot of basketball experience. So to give your players the best chance of success at the next level, it’s imperative that they’re competent playing man-to-man defense. By playing a zone defense, you rob the players of all the fun that basketball should be providing them. Barely anyone is able to make a basket, both teams are throwing turnover after turnover, and every player is forced to throw up long-distance shots that have no hope of going in! Does this sound like a fun game of basketball to you? Because to me, it sounds horrible. We need to give all players a chance to fall in love with the game of basketball like we all did when we were young. I’ve heard every argument in the book from coaches in favor of running zones. Some of them are legitimate, others I find to be ignorant nonsense. Here I’m going to share my thoughts on some of the arguments coaches use that are in favor of using zone defense. The first thing that coaches must understand about zone offense is that although not all shots taken out of a zone offense are three-pointers, zone offense relies on the defense respecting the three-point shot. This is because if your team can’t shoot the basketball from the outside (and most youth teams can’t), then the defense won’t extend out to respect the shot which will open up gaps in the zone. 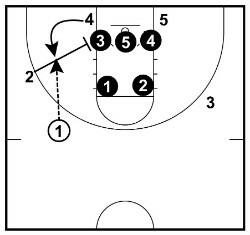 Instead, all 5 defenders will stand back in the key and wait for you to miss the outside, uncontested shot. This would be a decent argument at a higher level, but definitely not at the youth basketball level. Ball movement doesn’t achieve much. Most youth teams have no problem passing the basketball against a compact 2-3 zone. In fact, it’s often too easy! If the offensive player is at the three-point line to space the court, there’s often no defender anywhere near them. All the defenders are still inside the key or a step or two out of it. But they’re definitely not pressuring the basketball. Why should they? The defense knows they’ll miss the shot. The defense doesn’t particularly care how quickly or how well you move the basketball around the perimeter either. You can swing it from side to side 5 times and the only thing that’s going to move on the defense is their heads while they watch. They’re going to stand back in the paint and wait until you shoot it so that they can get the rebound. And there’s no chance your fantastic ball movement is going to penetrate the zone since all 5 defenders are inside the key and can basically touch hands if they all put their arms out. Screening the zone doesn’t help much. I’ve heard numerous people advise youth coaches that they should start screening the zone and I still can’t see how it would benefit the offense. Maybe screening one of the top players to get an open shot on the wing would work, but the offense is definitely not going to get a layup out of it. Down-screening one of their players and cutting outside isn’t going to achieve anything at all. The defense isn’t going to follow them and create a gap in the defense. They’re staying inside the key. The offensive team isn’t having any trouble getting open anyway. Once again, screening the zone relies on the offense being able to hit outside shots so that the defense is forced to chase and contest the outside shot. This is the only decent argument in favor of playing a zone defense. If your team is losing by such a wide margin every game, it won’t be long before the parents and players are sick of it and move along to another team. And, unfortunately, it’s often the best players that go first. If you are losing by a wide margin every game, you’d be far better off finding a new league or competition to participate in than you simply conceding to playing zone defense every game. The problem with this argument is made obvious by this simple quote from the great Don Meyer. By teaching an extra defense to your players, you’re stealing time away from skill development or opportunities to work on other aspects of their game. Do you really think implementing a zone defense is the best use of the limited time that you have with your players at practice each week? Coaches already have barely any time at practice with their players. When teams don’t have any practice time, they often resort to using a zone defense. I get it. It’s far easier to get a player to stand in one position close to the basket than it is to get them to stay between their player and the basket for an entire possession. But if you don’t have time to teach them man-to-man defense now, when will they have time to learn it? It’s imperative that we let players experience man-to-man defense as early as possible. To me, this is a prime example of putting winning at a young age over future development. It’s not difficult to instruct your players to stand next to one of the offensive players and stay between them and the basket. Sure, they’ll get lost a couple of times and your team will give up a few easy baskets, but they’ll gradually gain more experience and improve their defense. Once they’re getting a grasp of defending their own player, start introducing them to help defense. Teaching your players these little concepts can all be done during games and in the huddles you have before and after games. I have a feeling a lot of coaches will cringe when reading this argument… I know I did when I first heard it. How is hiding a poor defender in a zone going to help them with their man-to-man defense in the future? This is a clear-cut case of a coach putting winning before development. Allow the poor defender to gain more experience defending. That’s the only way they’re going to improve. In fact, they’re probably a poor defender because their previous coach only ran a zone and didn’t focus on their future development too. 6. “A good zone defense still teaches man-to-man principles. Players still close out, players still have to help, etc”. I discussed this topic earlier in the article but let’s quickly go over it again so that my thoughts on the topic are clear. Zone defense does teach some man-to-man principles, that’s correct. But, obviously, a man-to-man defense teaches those man-to-man principles a lot better than a zone defense does. So while the zone defense isn’t all bad, there’s a far better alternative. To me, this argument is used as an excuse to play zone defense when the coach wants to win. What a terrible argument this is. Let’s remember that many of the players either using or competing against the zone defense will be in their first couple of years playing basketball competitively. How long does it take to become a consistent outside shooter? A few years at the very, very minimum. How long does it take to implement a zone defense that stands in the key and barely moves? 1 – 2 minutes. Let’s also not forget that, depending on age, many players physically can’t shoot the basketball consistently yet no matter how much practice they put in! We’ve all heard those coaches that believe they can predict a players’ future at 8 years old. How a coach can come to such confident conclusions when players still so young is beyond me. Basketball is littered with stories of late-blooming players who went on to have amazing professional carers. Michael Jordan failed to make his high school varsity team as a sophomore and is now known as the best basketball player who ever lived. Hakeem Olajuwon didn’t pick up a basketball until he was 15 years old and is now regarded as one of the greatest centers to ever play the game. Tim Duncan made the transition from swimming to basketball in high school and is now arguably the greatest power forward of all time. And there are plenty more similar stories. No coach can predict which players are going to fall in love with the sport and work their tails off to improve. No coach can predict a player having a massive growth spurt in their later physical development. Don’t rule any player out! As we’ve talked about many times in this article, zone defense in youth basketball isn’t played the way a real zone defense should be played. 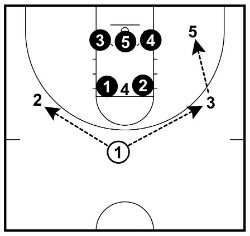 Defenders don’t close out, defenders all shadow towards the basketball because they know a skip pass won’t beat them, defenders don’t leave the key, etc. There’s not much any player will learn about a good zone defense when it’s run in youth basketball. And this fact alone does not justify taking time away from other things the players could be working on instead. Another classic case of a coach putting winning above development at an age when winning should never be the number one priority. If your players can’t play man-to-man defense at their current level, what chance are they going to have playing it at the next level? Because remember, as players develop and reach higher levels of competition, they will play far more man-to-man defense. We need to give all players the opportunity to experience man-to-man defense so that they’re prepared when they get to the next level. Hold up… don’t you post articles on zones and presses all the time? Don’t get me wrong, I love writing and talking about all different types of zone defense. I especially love breaking them down into simple guides that coaches can use to help their team. But these guides must be used age-appropriately and I don’t recommend them for any coach before the high school level. I haven’t done a great job of making this clear in the past and I will strive to do so much more diligently in the future. Going forward, what should be done about zone defense in youth basketball? There must be a consistent, easy to understand rule. • A team can only use zone defense when they’re losing by 10 points. 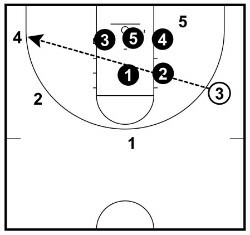 • A team can only use zone defense with 10 minutes to go in the second half. I don’t like these kinds of guidelines nor do I think they’re best for youth basketball overall. I agree wholeheartedly with Bob Bigelow’s opinion in my article on improving youth basketball (I encourage you to go and read his entire thoughts). It should be compulsory in all games before high school level for players to defend man-to-man half-court. The answer has been consistently (99%) – High school Junior Varsity… which is approximately 15-16 years old for readers who don’t have kids in the American school system. I questioned whether the internet needed my opinion on the ‘zone defense in youth basketball’ topic since there are other fantastic articles on the same topic already published with much the same points. Specifically this post by Tyler Coston and this post by Breakthrough Basketball. 1. I think there were a few vital points that were missing. 2. I wanted all BFC readers to know my thoughts on the topic. 3. I wanted to address the arguments made by coaches in favor of zone defense. If you do agree with the thoughts expressed in this post and are planning on becoming only a man-to-man coach (thank you), I encourage you to download this article and share it with other coaches, the parents on your team, and the players. By doing so, everyone will understand your reasoning behind not playing zone defense and will also be reassured that you have their child’s best interests at heart. Admittedly, you’re going to lose more games than you would if you ran a zone. That’s something we all have to accept. But take comfort in knowing that in a few years, your players will be much better prepared to continue pursuing their basketball dreams. And remember… As we always say at BFC: play to win, but understand winning is not the most important thing.